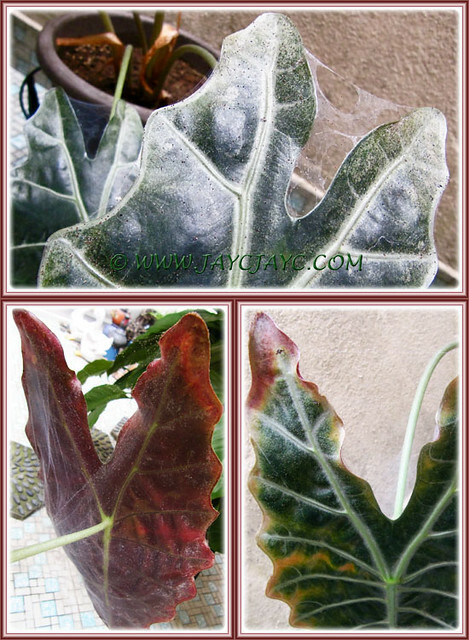 Alocasia sanderiana, commonly known as Kris Plant, are beautiful variegated plants that we enjoy having at our courtyard. 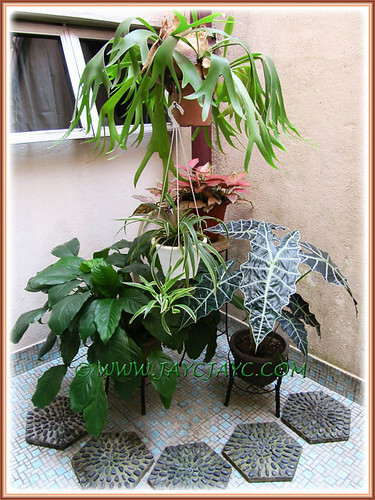 It blends well with other companion plants and shines outstandingly with its deep green foliage that are distinctly accentuated with whitish or pale green veins in wonderful contrast. Unfortunately, about two months ago, our pot of healthy plants suddenly took a turn for the worst. We hadn’t noticed that their attractive and shiny leaves were badly infested with some kind of disease until it was too late to salvage them or so we thought. Anyway, rather than trash them, I decided to try to save these treasured plants. 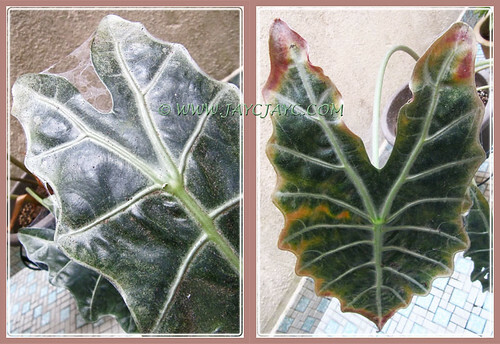 The whole foliage of the Kris Plant was a sure goner – every single leaf was mottled with silvery, yellowish or brownish patches and spots. Totally irreversible due to the severe extent of damage. Faced with this problem for the first time and not knowing what kind of pest was the cause of it all, I was clueless as to what should be done. So, using my gardening intuition and armed with a sharp knife, I snipped away all the leaves including the petioles (stalks) to about 1.5 cm above the soil level. Then, applied the pesticide, Malathion on the soil surface and simply left nature to nurture it. Of course, the routine watering was applied too. A month passed, followed by another couple of weeks and nothing happened, appeared neither alive nor dead. The experimental project seemed hopeless and I was getting impatient, but decided to give it another week before dumping it. Alas… by the end of the third week, both the diseased-ridden plants that had their stalks severely sliced to just about 1.5 cm from ground level, decided to resurrect! What a wonderful surprise to see small signs of growth. And, within a couple of days, two beautiful leaves unfurled to claim victory! Voila… success at last and how exciting! Almost two months in hibernation! 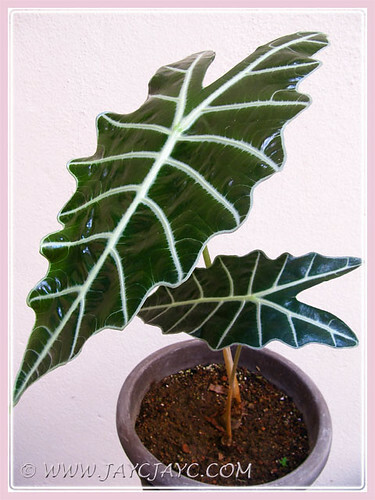 My darling John and I are absolutely thrilled that our Alocasia sanderiana resurfaced for our enjoyment again. Eeek… recently, our Variegated Crinum Lily suffered the same fate too! After much internet research the past week or so, we narrowed down the garden pest that attacked both plants to be the Red Spider Mite or Tetranychus urticae (reference: BBC Gardening – pest and disease identifier). You may want to know what other gardeners at Dave’s Garden do, to rid these hard-core garden pests. Humph… these buggers really drive us crazy! !